Nick & Stef's Steakhouse celebrates its 10th Anniversary with a special tasting menu through November. Oak Wood-Grilled Filet Mignon: If you're a serious steak fan, you're probably a wood connoisseur as well. And while the hickories and the mesquites boast their own rich notes, we like an oaky mildness come the last days of summer. 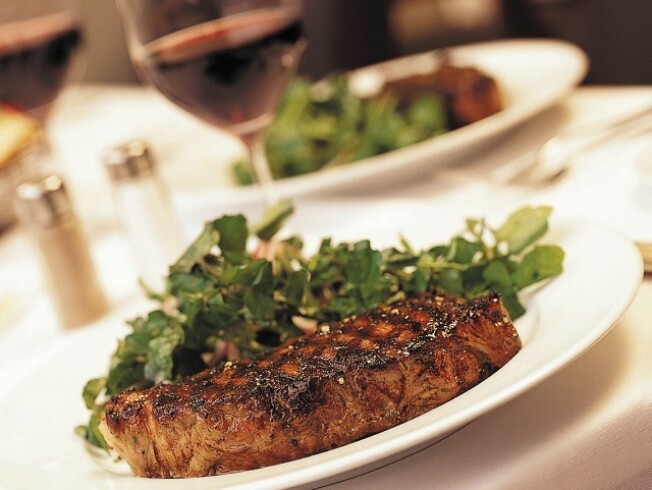 Who's serving it: Nick & Stef's Steakhouse downtown. What's the occasion? It's the 10th Anniversary of the Joachim Splichal steakery, and the restaurant is featuring a special tasting menu through November. What else is on the menu? A classic Caesar, pan-roasted organic chicken, salmon, and lemon meringue pie are among the choices. And the famous pureed JBS potatoes, a creamy-good Nick & Stef's staple. Impress your date: Close-ish to a million -- well, 912,500 -- steaks have been served at Chef Splichal's restaurant over the last decade. Might break out that little factoid while you're milling in the waiting area. Shows you studied up.